“I want to see the northern lights”. Been there, said that. But is it really that straightforward, even in Finland? Hardly. We’ve dug through the info and numbers, and hereby present the best places to see the Northern Lights in Finland and Lapland. The topic isn’t a light one for lots of people; it’s an important question since it can be the crowning event for anyone’s visit to Finland, and it’s an event that anyone who’s seen it will never forget. As always, to help a little that extra bit more, it’s Big in Finland to the rescue. Why are there so many Northern Lights in Finland? In the northern hemisphere, there’s a region in the upper part of the Earth known as the “Aurora Oval”. The Northern Lights happen within this area of the Earth, which is even further north than the Arctic Circle. Because of this, the Northern Lights (or Aurora Borealis) happens mostly in the north of Finland, in the region of Lapland. However, during periods when there’s high solar activity, like the current one, the Northern Lights can be seen further south. That’s why this year some Aurora Borealis was even seen in Helsinki! A special and unusual event indeed. There is a simple rule to spot Northern Lights: the further north the better. This especially includes the regions north of the Arctic Circle. In the scale above (logarithmic) we can see the number of nights where the Aurora Borealis phenomena happens, compared to the total of nights. This also shows us the best places to see it. A place that actually boasts a 100% chance of seeing the Northern Lights is Tromsö, but this city lies across the border into Norway, along the coast of the Arctic Ocean (also a good place to see the Midnight Sun). 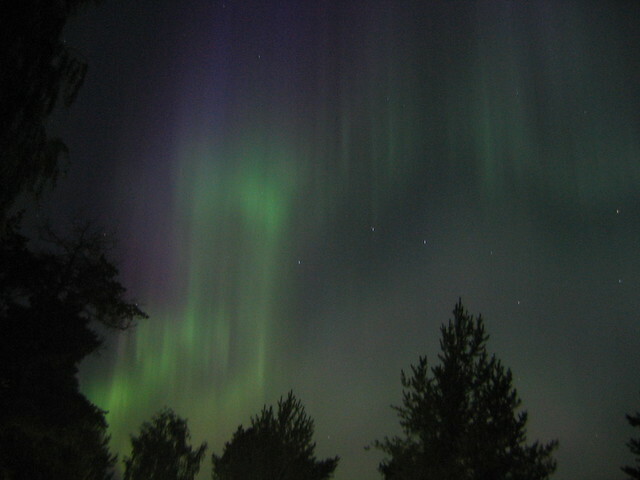 There, almost every night (when there are light hours, of course) the northern lights can be seen. The percentage of Aurora nights declines rapidly the further south we go. The easiest place to spot the Northern Lights in Finland is the town of Utsjoki, which is also the northernmost town in Finland (and offers, in addition to this grand spectacle of nature, a lot of fascinating Sami culture and is officially bilingual Finnish/Sami). Other towns and cities are: Rovaniemi, with a 45% chance; Oulu – lying at 65° northern latitude – with 30%; Helsinki, the capital of Finland, lying at 60° northern latitude, just a 5% chance. That being said, if we talk about concrete places – besides the ones mentioned above – the main municipalities within the Arctic Circle have good infrastructure to welcome tourist, and they have good organizations that make expeditions into the darkness when the northern lights are bound to happen. Sodankylä is the place where Finland’s National Observatory of Northern Lights is located, and therefore is one of the top places to see these spectacular lights in the sky. The Inari lake in Lapland, the third-biggest lake in Finland and one that contains most of Finland’s few fjords, is another good place. The National Parks of Luosto and Oulanka, also in Lapland, are good places as well: the key is that they don’t have light pollution, which is the key factor in seeing the Northern Lights properly. Just to mention a few more good spots to see the Northern lights, we can add Kakslauttanen, next to National Park Urho Kekkonen (one of the most important Finnish presidents in History); Ivalo, a nearby town; Nellim, on the opposite shore of the Inari Lake; and finally, Kilpisjarvi, a lake in the west of Finland, in an area next to the border with Sweden. Arriving to those best places to see the Northern Lights can be quite a challenge, though. The population density in Lapland is small, and the distances are long. However, if you want to go hunting for the Aurora Borealis, Revontulet – its name in Finnish, which means “fox fires – in Lapland, is very much worth it. On this map, we point out the places to see the Northern Lights that we named aboved, so you can have a better idea. With these recommendations, I bet your chances of seeing the Northern Lights will get much better. Good luck with it, and keep yourself warm because it is sure to get cold. If you have seen already the Northern Lights, where was it?